Jennifer’s Ugly Bathroom has taken the grand prize! Congrats to Jennifer! We’ll keep you up to date on her project! Our friends at Brizo– creator of designer fixtures for kitchens and baths – have added to the jackpot for our grand prize winner! A big thanks to Brizo for sweetening the deal for our winner! And – good luck to our finalists – one of your bathrooms is going to look great with a new Brizo faucet! Take a look at each ugly bathroom (see who owns that “so-out-of-date-it-is-ALMOST-cool” gold tub) and vote for the one you think deserves our help! We are looking for the ugliest bathroom! Do you have old, rusty fixtures, horrible tile that makes your bathroom look like it is stuck in the 60’s? Did the previous owner of your home use wild wallpaper or strange cabinets? We’re hosting an ugliest bathroom contest. And when we find it – we’ll be giving it some much needed design inspiration and some great products to help you remodel the space in style! 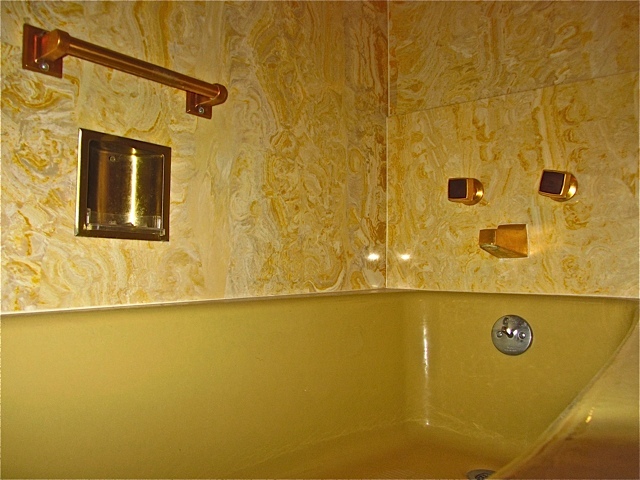 The winner of the the ugliest bathroom contest will receive the Gold Series package from ProfessionalKitchenandBathPlans.com, Patricia’s virtual design service for bath remodeling. Patricia will create a complete plan for your bathroom remodel and will walk you through every step of the process – from laying out your new bathroom design to choosing the colors, fixtures, cabinets and more. This includes a comprehensive bathroom remodeling design consultation from start to finish. Detailed Floor Plans – Showing centerline dimensions of all cabinets and fixtures. Detailed Elevations – Showing door and drawer detail. Location of hardware. Centerlines of fixtures. Dimensions of all cabinet boxes. Floor Plan Specifications – All items on the plan view are numbered coordinating with written specifications. Lighting Design – Mathematically formulated. Scope of Work: List all the members of the team needed to complete the project and their duties to be performed. Unlimited Designer Consultation:Includes providing photo image of color board. WarmlyYours Radiant Heating is offering our grand prize winner a radiant floor heating system for the new bathroom that Patricia designs for them. Radiant floor heating is a great way to turn the function of heating into a high-end feature in the kitchen. Heat radiates up through the flooring – whether it’s tile, stone, hardwood, laminate or even carpet to warm your bathroom. Visit WarmlyYours for more information about heating your kitchen, bath and other areas with radiant warmth. NiftyNob.com will outfit our grand prize winner’s bathroom with all of the knobs and bath accessories it needs. NiftyNob is one of the leading manufacturers of all varieties of knobs, bars, hooks, holders and other kitchen, bath and cabinet accessories. They are the only company with a patented, easy-to-install, towel bar mounting system: the Convert>able Bath Accessories. Our grand prize winner will shop along with Patricia at NiftyNob.com for all of the knobs and accessories they need to pull off a beautiful bathroom remodel. Finalists will receive a copy of Patricia’s soon-to-be-released videos “How to Survive a Kitchen and Bath Remodel” to help them with their kitchen remodeling project. The finalists will receive a great in-shower mirror, perfect for shaving! The Shave Well mirror is the #1 selling shower mirror on Amazon.com and consistently ranks in the top 200 Health and Personal Care items sold on the site. The Shave Well Company fog free shower mirror is packaged and warehoused at Sunshine Industries in Knoxville, TN. Sunshine Industries provides long-term sheltered employment to individuals with developmental disabilities. Employees are paid on a piece rate or hourly basis while they learn job skills and develop good work habits, with an emphasis placed on production and quality control. Individuals develop self -confidence, independence and a sense of accomplishment. Our finalists will get the help they need to keep their bathrooms neat and tidy with The 411 on Life Skills an ebook by Michele Sfakianos, RN, BSN. Do you know how to do laundry; clean a home; organize your bathroom or do repairs around the house? Michele will guide you through in this eBook on life skills you probably didn’t learn in school. Only submissions received through this form by 11:59pm EST on May 31st, 2012 will be considered. We will announce the finalists on June 6, 2012. Voting will begin on June 6, 2012 and the winner(s) will be announced on June 29, 2012. Finalists and winners of the ugliest kitchen contest are chosen at the sole discretion of Patricia Davis Brown, LLC.